This guide gives basic instructions for starting and using the VARS annotation interface. Useful definitions and descriptions can be found in the Glossary. If you need extra help or information, see Contacts. Start the program by double-clicking on the varsannotation.jnlp. The VARS logo will appear while the knowledge base loads and the annotation app starts up. This may take a minute or so. To begin using VARS you must first login, connect to the VCR, and open the tape set that you wish to annotate. For user login, type in your username and your password (or type ‘guest’). If you have not created a user account previously, select the Create a new user account. 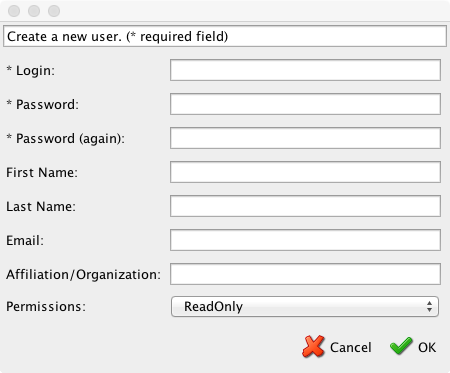 In the Create new user window choose an appropriate user login name and password. Also fill in your personal details including affiliations/organization. Once completed, select OK. Note: Do NOT use your network or any other secure password as it will be viewable by the VARS administrators. When in the lab: RS422 as the timecode source and choose /dev/tty.RS422 deck control under the RS422 port selector. When at sea: ‘Select timecode source’ should be set to UDP and server host and port numbers should already be entered and you should not need to alter these settings. 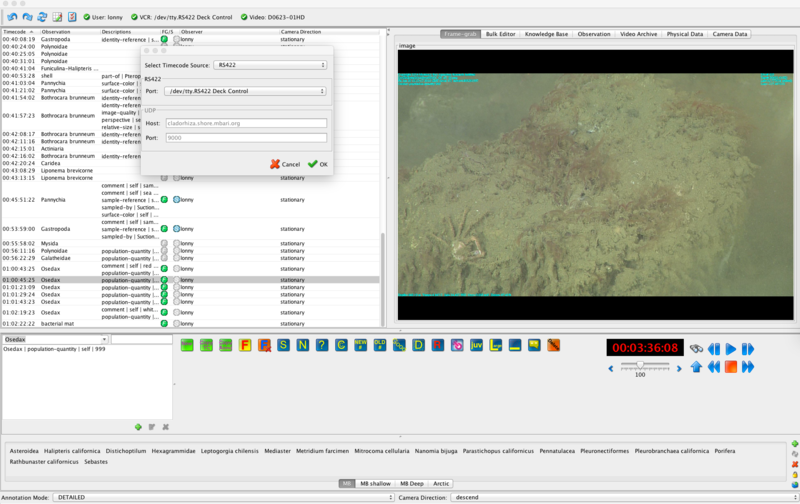 The interface screen now appears as below, note that the user and video connection boxes should now appear as green checks instead of red X’s. Annotation mode: At the lower left of the VARS annotation screen, choose an annotation mode (style of annotation). The default mode is Outline mode and is used for at-sea annotations. 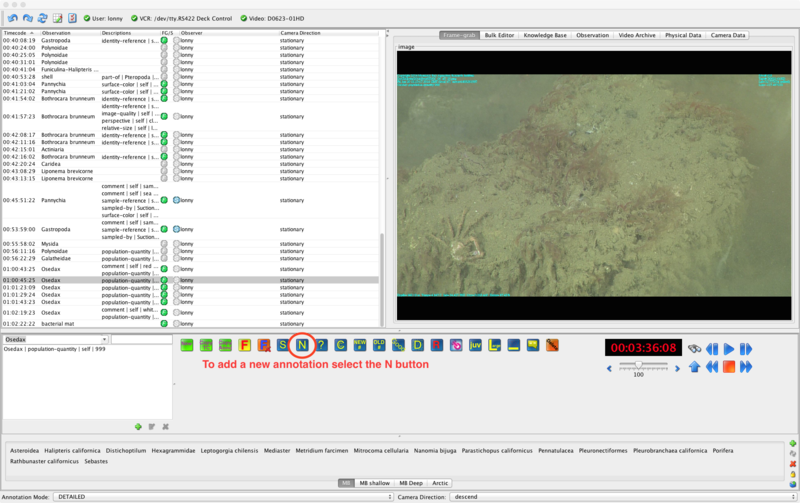 Camera direction: At lower right of screen describes the direction of ROV travel. The default direction is descend, but the direction should be updated as ROV direction changes throughout the dive. These are basic directions for creating and modifying annotations. Definitions or descriptions of the various parts of the interface can be found in the Glossary. Some keyboard shortcuts are included in the instructions. NOTE: We use the terms observation and annotation interchangeably in the documentation below. Click on the New button (or ctrl+N / cmd+N). A new annotation line will be created in the observation table with the default object in the observation column and with the current video VCR timecode. Type the concept name in the editor and press Enter. The new concept name will be updated in the observation table. To create an annotation associated with a frame grab, click the frame grab (F) button (or ctrl+F/ cmd+F ).The frame grab will be displayed in the upper right corner of the user interface, under the Frame-grab tab. By default, the concept physical-object will be entered in the observation column. The F button in the FG/S column of the observation table will be highlighted in green, indicating there is a frame grab associated with this observation. 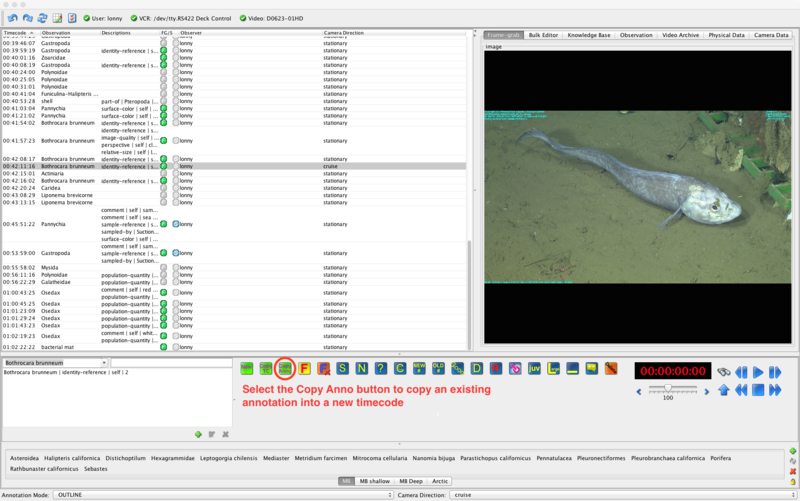 To give the annotation a more specific name (concept), type the concept in the concept editor (located just under the observation table), and press Enter. Click on the row with the observation to be copied. Click on the green Copy Anno button (or press cntrl + G on the keyboard). This will duplicate the observation and its associations to a new row with a new time code. To create multiple observations with the same time code, click the row with the desired time code. Select the Copy TC button (or press Cntrl + D on the keyboard). 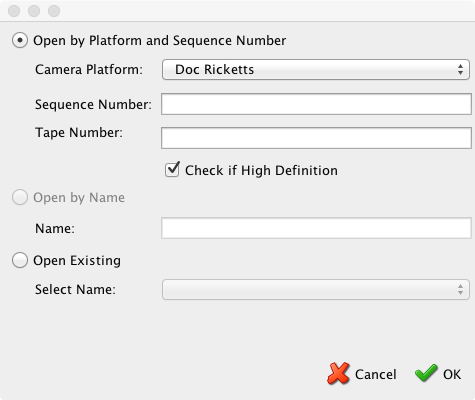 Rename the duplicate timecode observations as appropriate. An association is a structured descriptor that provides additional information about an annotation. For example, color of the item, behavior such as swimming or eating, resting on some substrate, etc. Add an association by selecting a row in the annotation table. In the concept editor click on the green + button. In the association search box, type part of the association you wish to search for and press Enter. You can continue to press Enter to scroll through additional matches. See buttons in the annotation glossary, for details. Highlight the observation line to be deleted. Click the red Delete button. The row will be deleted from the table (with a warning). Multiple lines can also be selected and deleted. NOTE: VARS has undo/redo buttons on the toolbar in case you delete observations you meant to keep. You can undo the last 25 operations in VARS. Highlight the observation row to be edited, so that the associations for that observation will appear in the concept editor. In the concept editor, highlight the association to be deleted. Click the red X (Remove Association) button and the association will disappear from the concept editor or the observation table. If you do a lot of annotations, setting up a custom icon tab (in the panel area across the bottom of the interface) allows adding new observations quickly. For this panel, each icon is really a word—specifically the name of a concept. 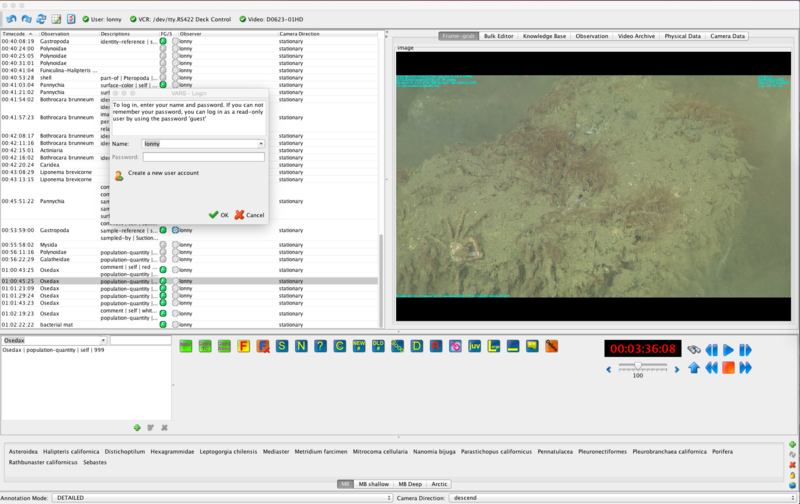 For efficient annotation, you can create separate tabs for different types of dives, such as Geology or Midwater, and populate each with the names of commonly observed objects in those categories. To create an icon tab, click on the New (green +) button at the right of the icon panel. At the prompt, name the new tab. In the concept edit window search box, type the name of the object that you would like to add to the tab. Press Enter until the correct object is highlighted. Click on the name, and drag it onto the tab that you created. The name is now an icon. Continue adding icons as needed. Organize the icons by dragging them around within the tabs. To delete an icon (concept) from a tab, right-click on the icon, and select Delete from the drop-down menu. To locate a concept in an icon tab within the knowledge base tree (for reference), right-click on the icon in the panel, and select Find in knowledgebase tree from the drop-down menu. The concept will be highlighted in its correct position in the knowledge base. Click on the icon with the name of the concept to be added. The observation will be added to the table along with the current VCR time code. Add associations as necessary using the Associations buttons or association editor. Email videolabadmin, or call 831-775-1829.